Description: Mediterranean Cuisine with gluten free options, vegeterian-vegan. 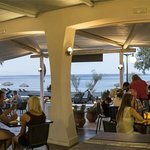 Located in Beautiful Santorini right on the Perissa beachfront. 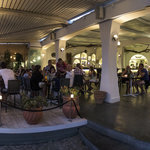 Relax sea side at our umbrellas, and come up for a bite to eat after a day in the sun...or we'll bring your food and drinks right to your umbrella! We pride ourselves on acquiring some of the finest and freshest local products that makes our authentic Greek food outstanding. went here after reading the reviews with my wife - and we were not disappointed. We had both a pizza (which was really hard to choose - the variety was quite high) combined with a .5 l carafe of white wine. After 20 minutes we both had the pizza. The place was not crowded, but also not empty. Serving time was, based on this, quite fast. Afterwards we decided to have the lava-cake with some coffee. The coffee was excellent. Only small thing to criticise is the lava cake. Unfortunately there was no liquid chocolate inside - so it was more than a hot brownie than a lava cake (but also very tasty). Service staff was very friendly and accommodating. Would go here again. 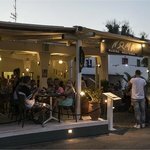 Here we had the best food in Perissa. The best Burgers. We had the Santorinian Wine also, which is very sweet. I would recommend this place to eat. A little expensive also. Noma Restaurant is by far the food paradise!!! The food there is amazing and the staff is so friendly and polite!! 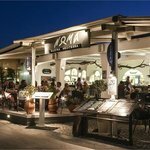 Their dishes offer a great variety of Mediterranean cuisine and they are sooo yummy!! 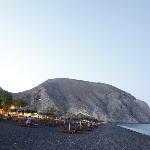 !if you are in Santorini at the Black beach Don’t Miss it!!! 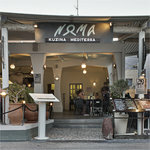 Been to Noma Kuzina Mediterra? Share your experiences!